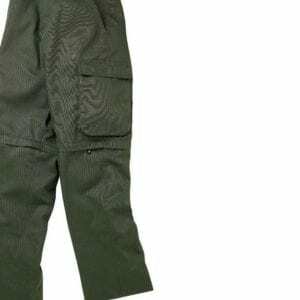 Made of a durable, lightweight polyester microfiber fabric, this pant offers enhanced comfort, protection, and design features. Enhanced features include Aegis Antimicrobial Technology for advanced protection against the growth of odor-causing bacteria, plus Superior Moisture Control-fabric wicks perspiration away from body and toward surface of garment for quick evaporation, keeping you cool when it’s hot, and dry when it’s cold! Other pant features and updates include: excellent sun protection with UPF rating of 40+, streamlined front pockets with drain holes for a slimmer looking pant, BSA buckle with attached belt in waist – belt loops for option to wear other belt, zip-off leg converts pant into shorts, gusseted inseam, all pants come unhemmed so you can customize the length. S equates to a 24.5″-25.5″ waist.